Note: To qualify for Upgrade versions below you must email us the Product Serial Number from the Constructor version you own (v7.0 - v13), and the name it is registered to. Picture of The Constructor in the EDIT mode. Picture of The Constructor in the RUN mode. Screen also shows an open Workbook. Picture of The Constructor with PLC I/O and a load PLC I/O module dialog box. Picture of The Constructor with wire generator screen. Picture of The Constructor with wire label screen open. It shows wire numbers applied to a Brady label template. 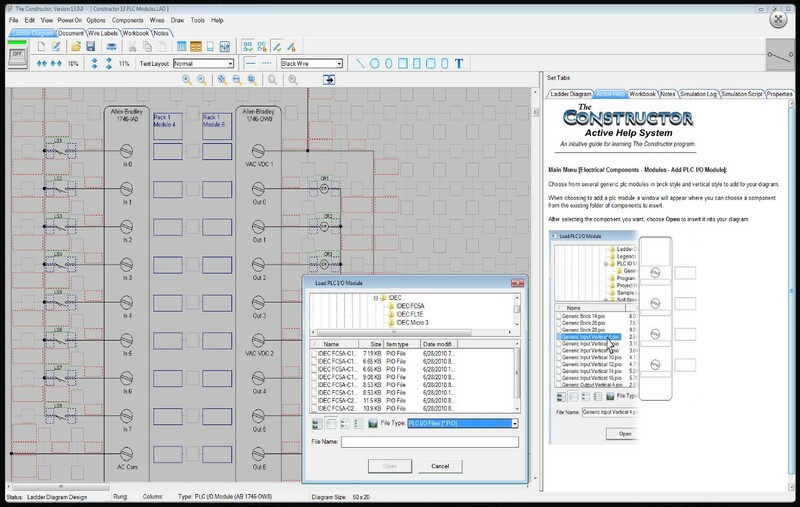 The Constructor program makes the creation, testing, trouble-shooting, teaching and printing of electrical ladder diagrams, schematics and one line diagrams fast and easy. 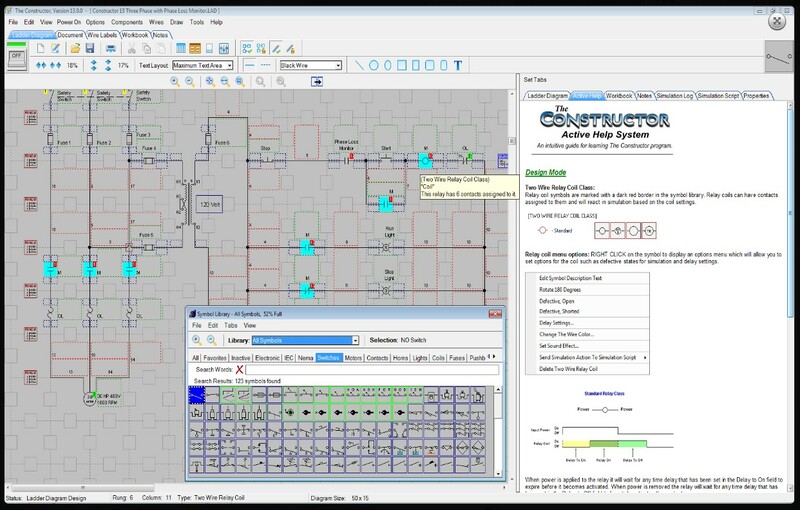 The Constructor Software is unique in it's ability to test an electrical circuit. Now the complete circuit can be tested from the three phase power components to the control circuit. See and Hear the circuit running. 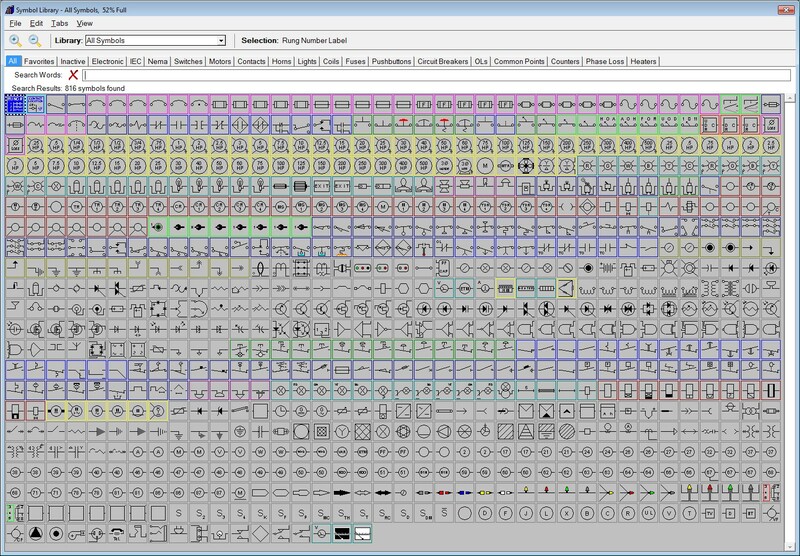 The built-in symbol libraries of over 720 symbols makes the creation of your diagrams fast and easy. 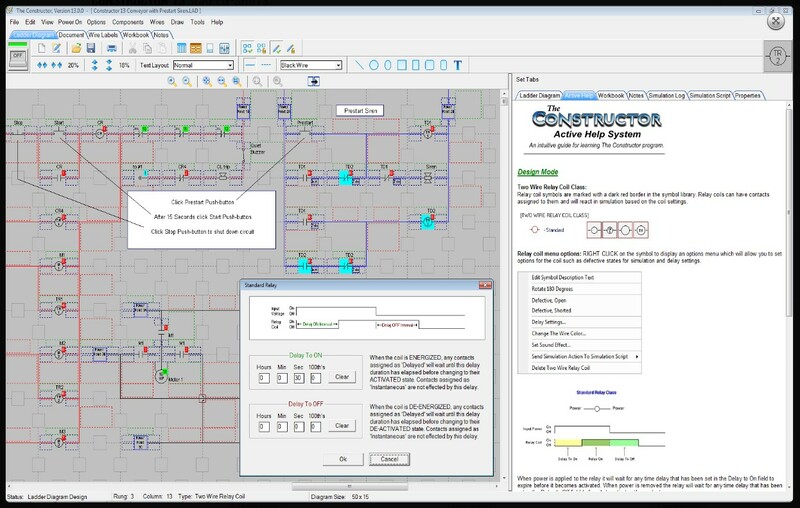 The Constructor program makes the creation, testing, trouble-shooting, teaching and printing of electrical ladder diagrams, diagram schematics and one line diagrams fast and easy. The circuit will perform the same as a hard wired electrical circuit. The design can be edited and re-tested saving valuable time when it comes to hard wired circuits and trouble-shooting scenarios. This program is unique in its ability to test an electrical circuit. You can see the power flow in the diagram and hear the sound effects when a motor or siren is energized. Once designed, any circuit can then be virtually energized and operated on your computer monitor. The circuit simulator is a great teaching tool. 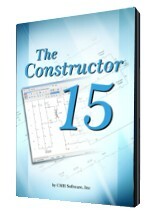 Our customers tell us the Constructor is the quickest and easiest electrical cad software they've ever used. The built-in symbol libraries of over 800 symbols makes the creation of your diagrams fast and easy. The built-in symbol editor allows you to create your own custom electrical symbols for that special project. Optional PLC I/O libraries are available for most PLCs (Over 1800 I/O modules) An optional additional sound library allows you to add 126 more sound effects to your circuit diagrams. Our new Active help system, help files, and a pdf manual makes learning to use this powerful software much faster and easier. Your complete circuit can be tested, from the three phase power components to the control circuit. 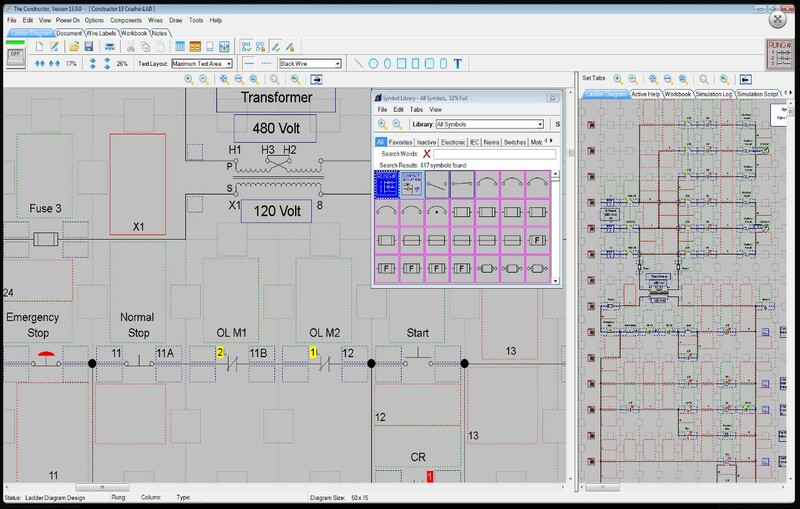 Many of our customers have used electrical cad software before and comment about how easy our software is to use compared with other electrical cad software. 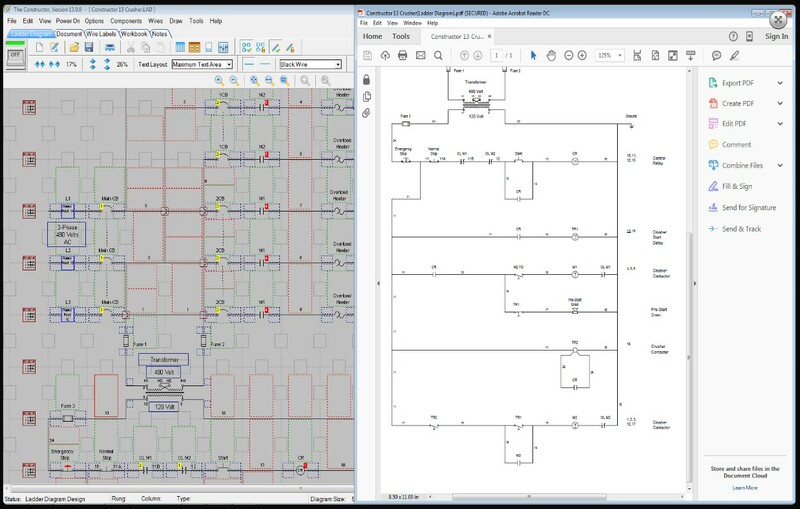 Powerful zooming features for faster editing and easier viewing of your electrical diagrams. Over 50 color schemes allow you to set your personal color preference. 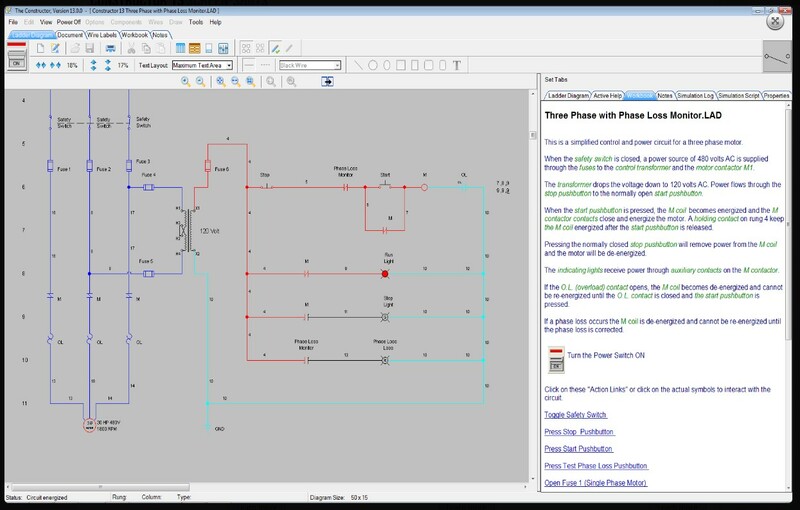 Automatic legends and borders allow you to make professional looking electrical diagrams quickly. 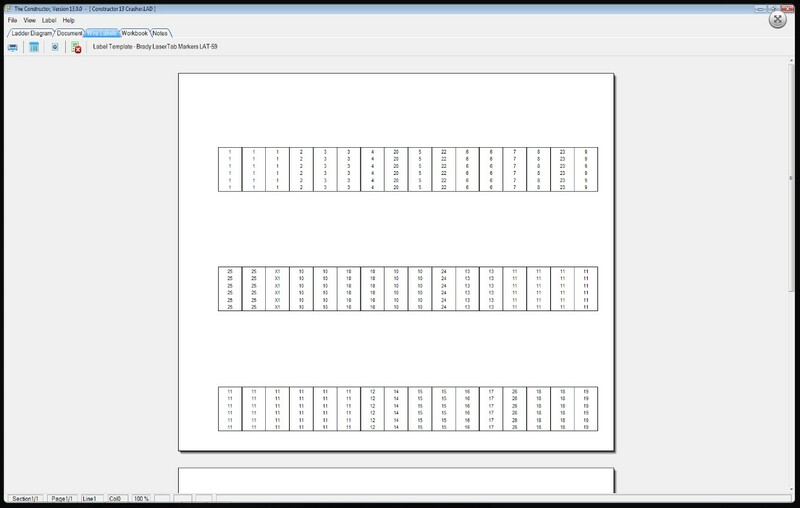 You can print your ladder diagrams out on your choice of any printer or plotter that Windows supports. The diagram may be saved to your hard drive, flashdrive or a floppy disk for easy reference or modification. You can also save images from within The Constructor program as bitmap files. The bitmap files can then be used for printing or imported into other programs. If you need to send a diagram to an associate now you can export your diagram as a PDF file. Exporting your diagram as a DXF, DWG, JPG, GIF, TIF or PNG file is also an option. Print wire labels using pre-designed wire label templates for Brady and other label manufacturers. 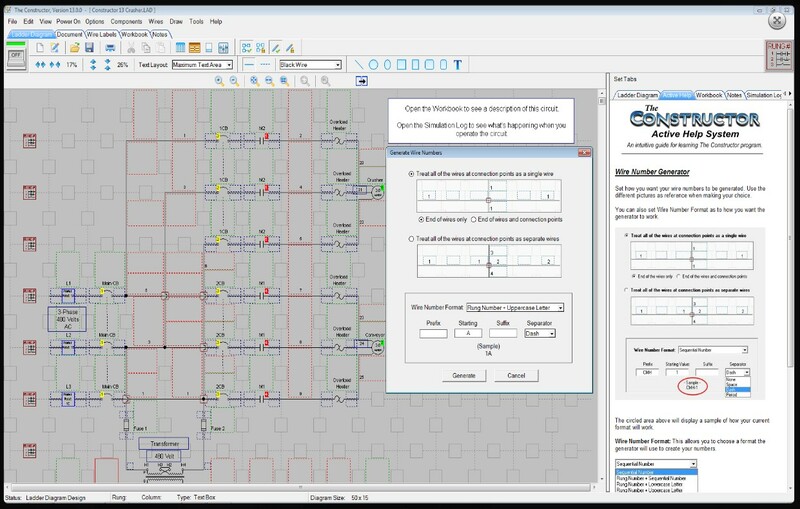 Our auto wire feature allows you to quickly add wire numbers to your diagrams with a host of options available. Optional PLC I/O libraries are available for most PLCs (Over 1800 I/O modules). An optional additional sound library allows you to add 126 more sound effects to your circuit diagrams. Works with Windows 7, 8 or 10.